Be forewarned--this is quite the saga! I have some terra cotta pots for herbs, but they don't look like these beauties. I wanted to snazz mine up a bit, but I've been having this huge delima about it. You see, what I LIKE best are the old, beaten-up looking ones like in the bottom right corner of the above collage. LOVE them! Totally my favorite. BUT my kitchen is bright and perky. I like it that way. 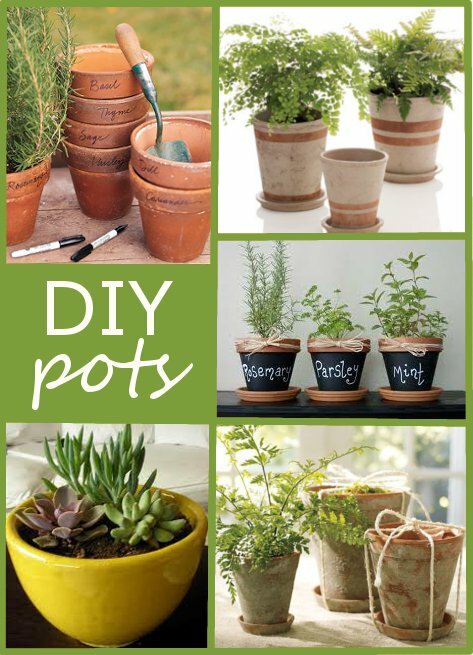 The rustic pots would look good in pretty much any other room in my house, but not my kitchen and since that is where I want to keep my herbs.... What to do, what to do--pick something I like most? pick something that would match the most? redo my whole kitchen? :) (as if redoing my kitchen to match a 50 cent terra cotta pot would be a good idea). Well, the ribbon idea was going to be cute, but not what I was going for. Too pretty. I was not a happy camper!! I was trying to spray one more glossy coat on them before heading out for a "Fun Friday" adventure with my kids and dropped one--right on top of the other. Grrrr. So, I stopped by the local Hobby Lobby to buy some more (they were on sale this week) and saw these cute little metal pots in the Easter section (the one on the right) (excuse my dishes drying on the counter top) so I bought them, thinking they'd be even better. All that trouble for a couple of pots. Sheesh. I do like how they turned out though. I love your little yellow teraa cotta pots, they are really cute. Thank you for sharing and have a great week! Love the look of the yellow painted pots with the black sharpie writing! Thanks for sharing this at Creative Juice. Stop by again this week!